Phoenix is the capital city of the state of Arizona. It is located on the Salt River in the Mountain Time Zone; as of 2006, Phoenix was the fifth largest city, by population, in the United States. The city was settled in the 1850s and was officially recognized in 1868. 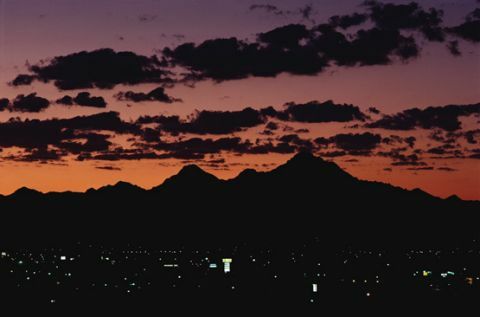 Phoenix is dry with scant rainfall, temperate winters with rare snowfalls, and hot summers. Mountains surround much of Phoenix. Phoenix is home to the state legislature and many major companies, among them telecommunications and high-tech companies. The city is divided into urban villages, and has more than 30 school districts. Luke Air Force Base, in the western suburbs, is a military presence. Sports clubs, such as the Arizona Diamondbacks, as well as museums and performing arts venues, are also located in Phoenix. • City of Phoenix - Visit the City of Phoenix, Arizona, official municipal web site. • Phoenix Guide - Business directory and maps of Phoenix, Arizona.